Local stamps were produced during 1945 for the Soviet occupation zone town of Lobau (Löbau) in Eastern Saxony. A reminder: One must realize that in the months and years following the collapse of the Third Reich, up to about 1948, there was really no civilian or commercial infrastructure, no local government, and the only national governments were those of the Allied occupation military forces. All of the local issues of Germany from this period, especially the ones with obliterating overprints on the stamps of the former Third Reich, have been heavily counterfeited. Authentic mint and used stamps from this period are actually very scarce. One must assume that unauthenticated mint condition examples of some of the local issues are either forgeries or reproductions. Likewise, one must assume that unauthenticated used condition examples from this period are either of "philatelic" in origin or have been favor-canceled. These all have minimal philatelic value. If one is buying unauthenticated examples of the post-war local stamp issues, please keep this in mind and DON'T spend too much money on them. 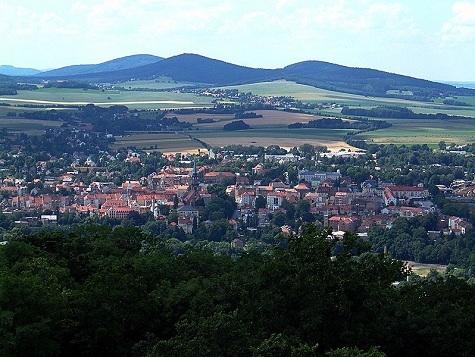 The city is situated between the slopes of the Löbauer Berg and the fertile hilly area of the Upper Lusatian Mountains, and it is the gateway to this volcanic mountainous area. Löbau was first mentioned in 1221 as "Oppidum Lubaw". During the Middle Ages the city was a member of the Six-City League of Upper Lusatia, consisting of the Lusatian cities Bautzen, Görlitz, Kamenz, Lauban, Löbau and Zittau. The King Friedrich Augustus Tower is Löbau's landmark. 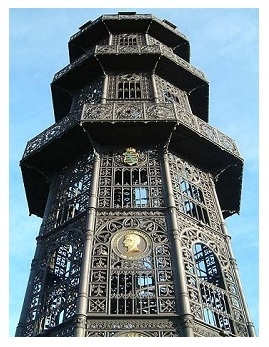 The tower, made of cast iron, was built in 1854 on the Löbauer Berg, and it is 28 m tall. It is the biggest cast iron tower in Europe and offers incredible views of the upper Lusatian Mountains. The town hall of Lobau is a noteworthy mixture of several architectural styles. Another interesting building is the Villa Schminke by the German architect Hans Scharoun. From the end of May through the end of June 1945, remaining stocks of Third Reich definitive postage stamps were obliterated for use in Lobau. The ornate, octagonal obliteration featured a negative "D" in the middle, which was the initial of a former postal official by the name of Dutschke. Examples from the 1933 Hindenburg booklet and the 1941-1944 Hitler definitive series are shown above. All of the denominations of the Hitler definitive series were used, and with the exception of the Mark denominations, genuine examples are not unreasonably expensive. "Genuine" obliterations are hand stamped using an oily ink that often leaves stains. Border detail is weak and often missing, and there is a wide frame break at top right. "Reprints" are carefully hand stamped. The border detail is better, but it is still broken or weak in many places. The frame break is smaller and sometimes almost disappears. The ink is not oily. There are also dangerous forgeries of these stamps, especially the higher priced ones. The forgeries often look "too good". Forged cancellations exist on these issues, as well. The prices for these local stamps, in the Michel Catalog, are for authenticated examples. Most of the reprints are valued in Michel at about 4.00 Euros each. The 1945 Volkssturn commemorative issue with this obliteration is considered a "reprint" by the Michel Catalog.